So another new year has come into our lives. And with it? Well, another year of my pointless banter about music. And what better way to start it all off than by posting some good ambient tunes by one Richard Melville Hall. 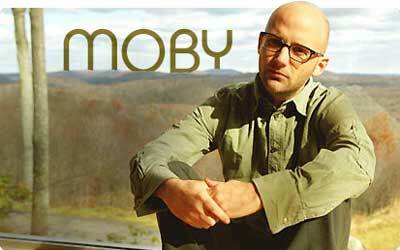 You guys probably know him by another name - Moby. The first track here is something I thought of the other night not really knowing why I thought of it. However, this one is one I said flat out to all my buddies on Facebook that I would want played at my funeral. That's a pretty morbid statement, yes, but it's 100% true. This is just a hauntingly beautiful song, and hell, it was even used in the Sopranos. So check out "When It's Cold, I'd Like To Die" off of the mid-'90's electronica breakthrough album Everything Is Wrong. The next one is off of his critically acclaimed album Play. You know, I had sort of skipped past a lot of this album. Not even sure why. This is one I had to be reminded was a great tune. After posting this one online, as well, I got one comment from the following video accompaniment to it. This song makes me *sob.*. Love it. So yeah. Go check this one out. The last one is a lengthy tune that doesn't really seem to be long enough, if you could believe it. This as well as Panda Bear's "Bros" and the Mad Professor dub of Massive Attack's "Protection" are all in select company, there. It's "Alone", off of the failed Animal Rights album. The album was one I anticipated, but definitely had the same reaction as many - confusion. It was a very different sound from what I was used to, but there was plenty on it to like. This, to me, is the standout track. Just gorgeous. Okay, go buy stuff. I told you to, so you're obliged.